Remember The Big Year Of Cars Contest? I Just Did! I bet you thought I forgot about the Big Year contest! Just because I almost forgot, probably. Well, I didn't forget, and now it's time to judge, so everyone put your cameras down and get ready to turn in your work. But first, let's recap. To win, you'll need to make a post showcasing your 15 best car photos. 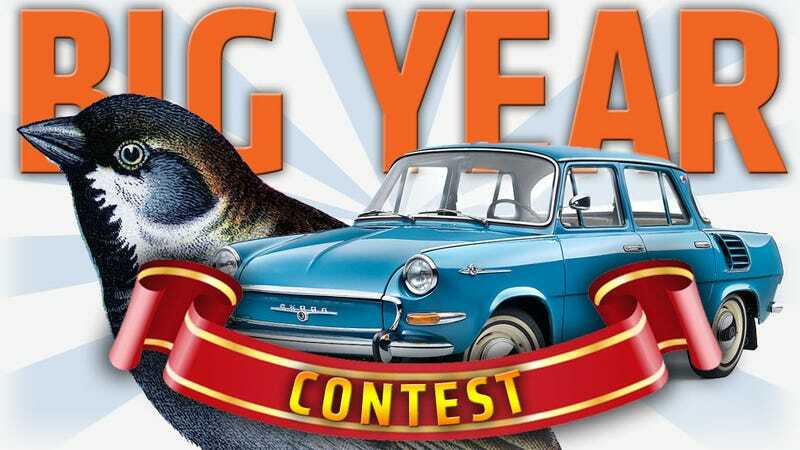 The winner will be picked by who has the most impressive set of pictures, based on rarity of the cars, quality of the photographs, the age of the cars (older gets higher points), and the general opinions of the Jalopnik staff, who will judge these. In the event of a split decision, the overall number of car photos will be the deciding factor. Individual years of the same make/model still only count for one entry. The goal is as many unique individual models of a car. You can't have, say, a 1959 NSU Prinz and a 1965 NSU Prinz and count them as two different cars. They're both NSU Prinzes. However, the older models will most likely count for more in the end, unless there's an unusual circumstance. Also, car photos must be of cars in the wild. In their natural habitats, on streets and garages. That means no going through a museum shooting pictures of cars. That'd be like the bird people shooting photos in the natural history museum. You can do better. The pictures themselves need to be taken by you, dear reader, and not just grabbed offline. That's why every picture needs to have an index card with your Jalopnik user name written on it, placed on the car or held in the shot. No cheaty Photoshopping, we can tell, having seen many 'shops in our time, and by looking at some of the pixels. But you knew that. So, now's where you show your 15 best photos. Make your Kinja page, post the photos in a post, and comment here with the link. We'll give until, oh, let's say January 15 for everyone to get their pages up, photos picked and all that, and we'll get a winner picked by end of January. We have the Detroit Auto Show in mid-January, so hopefully that'll give us enough time. So, everyone, re-read those rules, and post your links to your Kinja page of photos here. I'm excited to see what you came up with! UPDATE: Go ahead and skip that index card rule. I relent.